The hotel reception is compact and includes a bar,it would beefit from these two areas being reversed so the bar utilised the brakfast area and rooms and ift were left and right of the reception. A two person lift took us a bright,airy room with a spacious bathroom and independent w/c(Rare in IBIS) Bed was comfortable,WiFi strong and opposite was free public parkiing . Cognac is for cognac lovers,sadly I am not one but we dined well and it bennefits from a superb supermarket . Location is good. Hotel needs walls painting in a lighter colour it was quite gloomy in the rooms and corridors. Rooms are nice and clean. Personnel is very friendly. Breakfast is sparse if you go too late. 1. The bed was not made, the quilt was merely pulled up and the pillows thrown on top. 2. An empty bottle was not removed. 3. On departure no-one was at the front desk for 5 minutes despite the front door bell ringing 3 times with people entering or exiting in a 5 minute period, therefore we left without waiting any longer. We found the reception area and the breakfast room décor uninviting therefore ate breakfast out on both days. POSITIVES The hotel is in a convenient location with free parking across the road. The shower is a good, large size and having a separate toilet is a bonus. The layout of the room uses the space to it's best advantage. Hotel average. Breakfast good. Rooms ok. Didn't get much sleep due to air conditioning being very noisy during the night, we could also hear air conditioning in other rooms. Car parking was acceptable. We thank you for your opinion and remark. 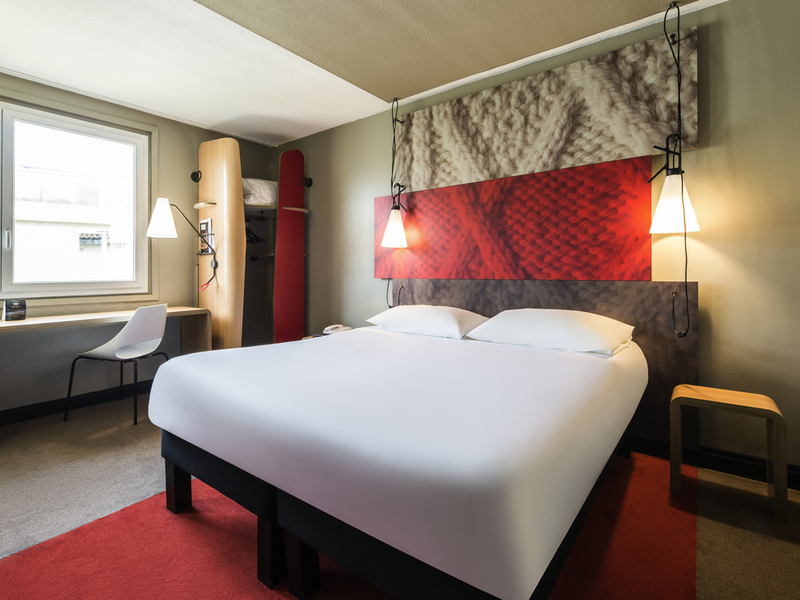 Rooms at he Ibis Cognac are stylish and spacious - a cut above standard Ibis rooms. The hotel is centrally located, within easy walking distance of the town centre, and the staff are extremely helpful in answering queries, providing maps and so on. Dear Customer, We would like to thank you for this comment which delights us. We are very happy to know that we have been able to meet your expectations during our stay in our establishment, Very sincerely. The hotel is clean, bright with friendly staff and is very well located in the town with a free car park directly opposite. The price we paid for six days over the week of the Blues Passion was excellent value. We would definitely recommend the hotel. Ok for a one night stay, Room a little tired. Toilet needed attention. Towels very old and worn. Good location for visiting Cognac close to all areas. Good low budget hotel in a great location for visiting Cognac. Nice clean rooms and was allowed to check in early. Bar area very small and whereas the selection of wines on the menu was good at 10pm availability was very limited. Very helpful and friendly staff as usual. Refurbished rooms, small but good. Handy location. Exceptionally located right in the heart of Cognac with very easy access to the SNCF train station (15 minute walk). All the big cognac houses (for visits) are also within very easy walking distance. No in-house dinning, but again its right in city center with excellent dining options all around and a very good supermarket within1 minute walk. Only drawback I had was that in this particular stay, the aiconditioning in your room (as it was explained to me) is set by the management (not the guest). So there is summer setting (you can cool your room but not heat it) or winter setting (you can heat your room but not cool it). At the time of my visit in September it was set to winter setting so only heating - no cooling. Well, as climate change would have it, in September it is now 23C outside. In the room, the temperature soared to almost 30C. When I mentioned to the front desk that my preference for getting a good nights sleep was in the 19 to 20C range (air conditioning temperatures), I was told that the only thing that could be done was to open the window and see if it were more comfortable then. Basically, I got no sleep. There is a card in the room that says there is a 15 minute guarantee that you are happy with your stay or your stay is on the house...... Anyway, beautiful city (one of the best I have visited), lovely people and had a great time. I cannot understand how a hotel can still be using a separate toilet with no washing facilities! One has to come through and close 3 ! doors to reach a wash basin after use of the toilet! Is this still allowed in France today? Sir, Thank you for taking the time to write to us as a result of your stay at ibis Cognac. We are sorry that the service and delivery were not up to your expectations, and please accept our most sincere apologies. Ibis hotels are eager to offer you the best quality of service for your stay; Therefore, your opinion is very valuable. Rest assured that the necessary measures will be implemented to improve the quality of the services mentioned. Again, we thank you for your comments and hope to regain your trust during a future stay. Waiting to see soon you, we pray you to believe, Sir, in expressing our feelings the best. one negative point - cognac is in one of the worlds biggest wine areas but the ibis bar was unable to supply a glass of white wine of any kind! Why?